Pickpockets are an issue near Sacre Coeur and the Moulin Rouge. I’ve tried to route you away from the most touristic parts of Montmartre, but some bits are unavoidable. Click for tips on avoiding pickpockets in Paris. You’ll find a map of this Montmartre walking tour at the bottom with step by step directions that you can print (or save on your phone). The name of Montmartre was named for the namesake hill from Roman times (Mount Mars). In the medieval ages, most of Montmartre was an abbey, however this abbey was destroyed during the French Revolution. For many years, this area was distinct from Paris, only a commune on the outskirts. 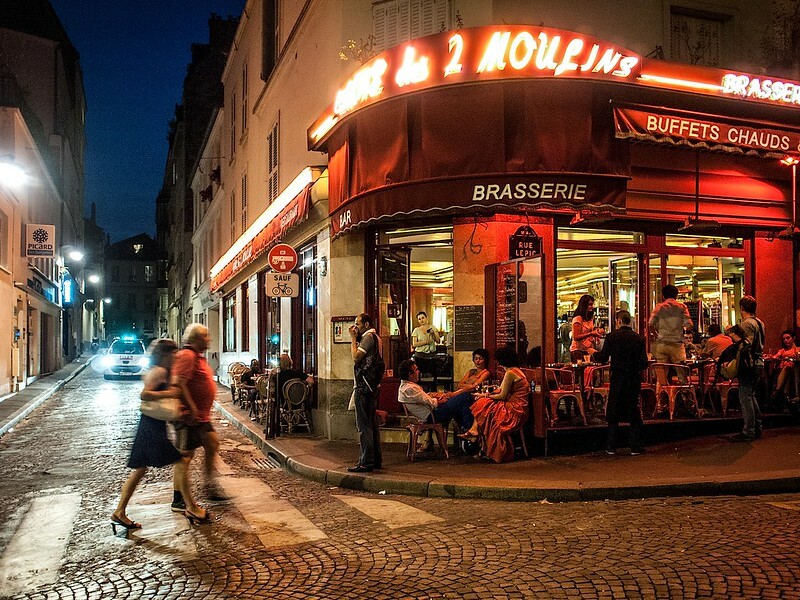 During the time of the impressionists, Montmartre gained a reputation for cafes, dance halls, and cabarets, which attracted many artists to the area. This included Vincent Van Gogh, a favorite painter of mine whose roots I traced in Belgium, and Picasso. If you can imagine many windmills in Montmartre, there were dozens in Van Gogh’s time. The Belle Époque ended and many of the artists who came to the former village for cheap rent ended up being pushed out. Despite many tourists and increasing housing prices in this arrondissement, Montmartre still has some working artist studios remaining. This walking tour will bring you to one of these hidden art studios if you’re lucky enough to get inside. (Art is one of my favorite mementos from traveling although I’ve only recently started collecting it.) Montparnasse proved to be the next bohemian area in Paris. This walking tour is intended for people who are fine with uphill/downhill walks as well as stairs. Without stopping, the total walking tour should take about one hour, so give yourself two hours if you intend to enjoy your morning or afternoon in Montmartre. The distance covered on the walking tour is 4 kilometers or 2.5 miles. Be sure to reward yourself with French macrons at a bakery after your long walk. Pigalle is rapidly changing from its slightly sketchy past as the home of the red-light district in Paris. (We’ll discuss this another day!). However, start your journey at the Pigalle Metro station, along lines 2 and 12. From here, you’ll need to cross the road towards Cité du Midi, which was made famous in the namesake film (“Cité du Midi”). Down this street, you’ll find a charming street filled with ivy away from the loud crowds and tourists in Paris. Here, you’ll find white-washed doors with a hint of exclusivity. Similarly, you’ll find the former Pigalle Baths as well as the former Pigalle Theatre. At the time that I visited, a gate was about to be constructed near the back area, so be sure to appreciate this stunning little village of Paris before it’s closed off to the public. This private villa constructed in 1896 is a blend of architecture styles. Although the imposing gate keeps most curious passerby’s out, my friend Emily and I were lucky enough to be invited in by a resident. Outsiders are not allowed inside Villa des Platanes, so you’ll have to make do with viewing it from the exterior unless a resident invites you in. My photos might be the closest that you get to entering, but it’s still beautiful through the fence. How can you miss the The Moulin Rouge? I personally think that it’s best seen at night or around dusk. The Moulin Rouge is the birthplace of the can-can dance and you can still go to (touristy) shows at the Moulin Rouge. You’ll be away from the crowds soon, but keep an eye on your stuff here. This narrow street has been perfectly preserved from the 1920s, which you can find from its iconic post marking the entrance. This was the home of Montmartre’s longtime mayor and its greenery is a breath of fresh air compared to the rest of Paris. Towards the end of the alley, you’ll find a stunning 1920s house stuck in time although it might not be viewable once the gate goes up again. Any Amélie fans here? This iconic cafe was her place of work in the film. You can still sit in this cozy French cafe, which has a poster of Audrey Tautou in case you forgot which movie that I’m talking about. I’m a sucker for movie locations, so I had to pass by here. As a Van Gogh fan, I had to pass this landmark, which was Van Gogh’s home in Paris. Vincent Van Gogh and his brother Theo lived on the fourth floor of this building (42 Rue Lepic). Van Gogh painted on the streets of Montmartre for two years using this home as his home base until he moved to the South of France. You cannot enter unless you’re having a function, but you can admire its exterior at least. This functional studio is one of the few artist studios in Montmartre that you can still enter today. During weekdays (typically between 9-5pm), you’ll be able to enter this partially-open covered passage that still is home to artisans. Please be quiet and polite as it’s a privilege for the public to enter this area and this policy might change if people are inconsiderate. For those looking for a true masterpiece to bring home, consider stopping by the studio of Véronique Darcon Cazes, a famous French artist who produces stunning mosaics. I just enjoy walking down this cute street. Although I have never gotten beyond the entry again, the“Cour aux Juifs” is viewable from number 40’s entry gate. This building was once used as Picasso’s studio. It’s not open to the public, however it’s still rented to artists and writers from all the over the world for minimal rent. The original building is not there, but you’ll know you found it if you find the green doors. For graffiti, you’ll want to walk down this short street to admire the local and foreign graffiti artists who have left their mark. Although it’s illegal to do so, this is one of the most coveted streets in Paris and you’ll likely see completely different street art than what I saw. Look for the iconic Space Invaders graffiti that you’ll spot all around Paris, made by a French graffiti artist. Le Moulin de la Galette is certainly a tourist attraction, however it’s worth stopping to see one of the last remaining windmills in Montmartre. At one time, Montmartre was covered in windmills as they were commonly used to grind materials. This windmill, a favorite of Vincent Van Gogh, was used for grinding flour. The owners of the windmill created a brown bread (Galette) that was so popular that the windmill got its name from it. The building underneath has had many purposes over the years, however it’s now a restaurant. From here, make a left onto Avenue Junot prior to making another left to reach Villa Léandre, which is widely considered to be one of the most beautiful streets of Paris. This stunning location, named for the famous singer is one of the best viewpoints in Paris of Montmartre. Say hit to the bust of Dalida and continue up the stunning Rue de l’Abreuvoir, one of the most beautiful streets in Paris. Some say that Paris in the rain is enchanting, but you can judge for yourself if you prefer it in the rain compared to a clear night right after a downpour. This winding street was named for the water trough that used to exist at 15 Girardon Street. It’s definitely a lovely street to walk along. Even my husband wandered off to admire the details on the ornate buildings. The house was purchased in the early 1900s by Germaine Gargallo, the wife of a well known painter. The house become a famous gathering place for artists. However, it truly became famous after painter Utrillo created a painting of it. It’s lovely to view and photograph from the exterior. Ever since the Romans conquered Paris, there has been a vineyard in Montmartre and it is the oldest vineyard in Paris. Now sponsored by the city government, the vineyard at Clos Montmartre creates a small number of bottles per year that are sold for charity. (Tours are free although you must pay for a tasting.) It’s just really cool to see a vineyard in the middle of the city. For the best views of Sacre Coeur without the crowds, walk around the other side of Rue de la Bonne for epic views of the Sacre Coeur. Despite the crowds near the front of Sacre Coeur, there’s almost nobody else here. Basilica of the Sacred Heart of Paris, Sacre Coeur, is one of the most famous churches in Paris. Built in the late 1800s, this impressive church is actually best seen from quite a bit below as the crowds and height make it difficult to get the perfect photo. This is one of the best spots in Paris to sit to enjoy the sunset over the city although I caution to be aware of your stuff as it’s also a favorite of pickpockets. You can climb the tower for the highest views in Paris! Place du Tertre is quite touristy, but if you love watching street artists work, this is one of the best places to sit outside. After seeing a real atelier, this might not appeal to you,. The alleyways around here are particularly pretty (especially once you get far away from the Starbucks). I’ve not included a photo of the main square, but you can find some gorgeous alleyways and stairways off of it. If you’re feeling a bit hungry at the end of this walking tour of Montmartre, consider stopping off at this well-known bakery in Montmartre for macarons. (You’re almost done!) You’ll find many cafes in the areas as well as picturesque stairways. This world-famous mural of love written in many languages is a favorite among instagrammers and couples in love. Your little tour of Montmartre ends at one of the cutest Paris metro entrances (in my opinion). The entrance is one of the only remaining glass covered Guimard original Metro entrances in Paris. Abbesses is the deepest metro station in Paris and part of line 12. Expect stairs. Click for your map of this walking route through Montmartre! Click for the downloadable PDF directions of the MontmartreWalkingTour. Have you been to Montmartre? Anything else that you’d add? Feedback on this walking tour/route appreciated! Click for a walking tour of the Paris covered passages, my guide to the 14th arrondissement, tips for visiting France on a budget, an one day itinerary for off the beaten path Paris, and tips for avoiding pickpockets in Paris. You found some of the cutest spots! I am so sad I missed these spots when I went last summer, Great post! Thanks for such a wonderfully detailed guide! There’s so much to know about this beautiful corner of France. You’ve captured this area stunningly in your words and pictures! I think my last comment didnt go thru 🙁 I love Paris and pretty much want to go right now after reading this. This is the best way to see a city! I love self-guided walking tours! It’s my favourite way to experience a city. Thanks for sharing your secret places to check out 🙂 Montmartre looks so charming indeed. Merci Beaucoup for this detailed guide. We’re visiting Paris in May. Looking forward to exploring Montmartre. After literally hours of Pinterest searching over time. Found your so perfect for us guide to Montmartre. Staying there 10 days from May 29 on Rue Orsel. All other guides are tourist destinations. We want to wander, be delighted and enjoy just being there. Not my first trip. Thank for this inspiring walking guide. Will be taking it and reporting back when we return to Canada. Cheers. Thank you so much for your kind comment and glad that you found what you were looking for! I really hope you enjoy it and please let me know if you have any feedback, so I can tweak it if needed.